There are different structures throughout Dragolandia that need to be purchased, built, and upgraded to be able to progress in the game. The Breeding Den and the Hatchery are necessary to breed and hatch Dragons, whereas Habitats or the Dragon Vault are required to house them, and the Farms and Temples are essential for leveling Dragons up so that they can provide a source of income and participate in battles. The Ancient Portal is used to travel to the Campaign Map, where various characters are battled. The Trainer can also compete against other Trainers in the Arena's Dragon League competitions. In order to have a greater advantage in battle, Dragons can have their competitive stats enhanced at the Enchantment Altar and can have their skills increased by training at the Dragon Academy. Trainers can choose to collaborate with each other and form Clans, which are hosted in the Clan Fortress (the only place where Clan Dragons can be raised). Although not necessary, there are other buildings which enhance the gaming experience. The Lighthouse allows friends to be added so that gifts can be exchanged and Rusty Gates may be opened without spending Gems. The Totem of Friendship allows Trainers to earn points for interacting with friends and receive rewards after accumulating different point totals. Some buildings offer practicality to the Trainers, such as the Gold Vault, which allows the Trainers to collect the Gold from all Habitats at once, but is limited to Trainers whose VIP Status is active. Other buildings deal with aesthetics, such as the Fountain of Youth, which restores the baby form of any adult Dragon while allowing them to keep their enhancements, levels, and skills. Some buildings in the game, after being selected, have options for various actions. Trainers can use these to: see information about the building, upgrade it, sell it, or store it in the inventory . 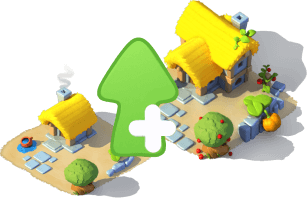 Buildings that can be upgraded in exchange for Gold will also have the option for being upgraded instantly in exchange for a certain sum of Gems. 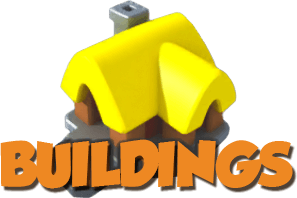 Buying some of the buildings can be done by accessing the Main Shop and choosing the tab. The same tab is available in the inventory where it is used to filter the buildings from the rest of the storage. Below is a table listing the sizes, in squares, for all of the movable buildings in the game. This page was last edited on 7 December 2018, at 10:35.